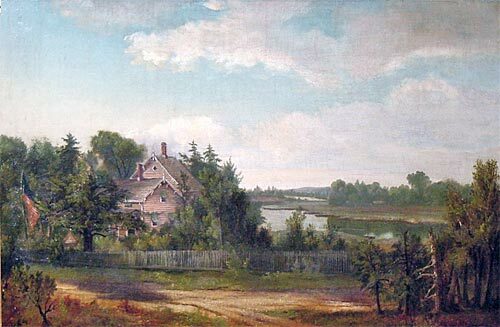 Bowman's Homestead on the Cayuga River, oil on canvas, 13"x22"
21"x30" framed, signed verso and dated 1864 inscribed "Buffalo, NY"
Born in Sundsvall, Sweden, on April 30, 1819, Lars Gustaf Sellstedt was a portrait, landscape, and marine painter. At the age of 11, Sellstedt became a cabin boy on a Swedish trading vessel and worked as a merchant seaman until 1845, when he settled in Buffalo, New York. Sellstedt took a studio and began his career as a portrait painter. In 1850, he married Louise Lovejoy and they lived in New York City for a brief period of time; she died a few years later in Buffalo. In 1853, Sellstedt visited Stockholm, but returned to Buffalo and married Caroline Scott in 1856. Their home became a center of artistic activity. Sellstedt helped to arrange an art exhibition in 1861 that led to the establishment of the Buffalo Fine Arts Academy; he served as its president in 1876 and 1877. In 1872, Sellstedt sent his self-portrait to the National Academy of Design; it won a commendation from Daniel Huntington and led to his election as an associate. In 1875, he became a National Academician. Sellstedt was active in the Saturn and Liberal Clubs of Buffalo. In 1904, he published his autobiography From Forecastle to Academy: Sailor and Artist and in 1910, Art in Buffalo. Sellstedt died on June 4, 1911.